I guess it hasn’t been all that long since I started practicing yoga at FlowYoga in Redmond, but the days of not being able to touch my toes are long gone. I can hold my own in the crow pose, but still find some of the bends a little over the top! That’s ok for I’ve always got tomorrow to give it another go. Being a student for more than a year now has introduced me to the styles of a few different instructors, and I have to say that there are particular attributes that seem to stand out from the better instructors. Yet, better, is a relative term so I’d like to outline what I mean in a little more detail. Yoga instructor characteristics that enhance the students experience. As simple and difficult this task is, making eye contact shows attentiveness, openness and truthfulness. Every effort should be made to engage in this process and encourage the energy that it inspires. Yoga in a class setting is a process of shared energy. When the class performs in a synchronous fashion, the energy in the room becomes harmonious. It’s the instructors responsibility to direct the student into the correct postures through the correct sequence of moves. Setting the intention for a single move before any movement has occurred offers the opportunity to move the class in unison. For instance, for down dog, the sequence “Lift your right leg towards the ceiling inhale, move your leg forward exhaling, drop your left heel down and inhale into warrior one” is harder to follow than “prepare for warrior one, inhale your right leg towards the ceiling, exhale your right foot forward, drop your left heel and inhale into your warrior.” Anyone that has done a warrior pose knows the basic sequence of moves, thus, if they know where they are going, they will get there with the breathing instructions from the master yogi. This same preparation holds for longer sequences. If you’re going to warm up with a Sun Salutation A, let it be known ahead of time so the students are not guessing exactly what will unfold and then follow the individual instructions that take you through the transitions. It’s probably more important to prep the student, or set expectations, for more strenuous movements. For instance, if the sequence will involve three warriors, two side angles, a standing splits and three different folds all stressing the same key muscles, the instructor should set the sequence expectations ahead of time so that the student can make better decisions regarding alternative moves in the early part of the sequence. The idea is to lead through the strenuous sections to a relief pose that the student knows is coming. Someone will always work harder when they know when the rest is coming. Breathing is where strength and art is found. Leading with “Inhale your arms out and up” works better than “arms out and up inhaling” or, “prepare to finish the sequence, inhale deeply… now exhale your feet forward …” which places the focus on moving in harmony with the breath. When demonstrating a new move or expressing the art in an existing move, it’s important to make yourself visible so the aspects of the move can be seen clearly. If the move is asymmetrical, demonstrate the movement once facing one direction and then when it’s actually performed by the class face the other direction. This way, body placements that might have been out of view the first time, are in view the second time. More importantly, if you want to demonstrate a move to a specific individual, setup in their line of vision. For instance, if they are in down dog, lineup beside and slightly behind the person so that they can see as they make their next movements. Keep in mind that if they are going to open to the left, you should be on the left side so as they open, you’re straight in their view. Words can get lost in translation, drowned out in music or simply spaced, but when you touch the muscles that should be worked there is absolutely no misunderstanding what is intended. This is also an easy way to confirm the student is following directions and performing the move adequately. It’s easy to be sensitive to the skill level of a beginning student. It’s more difficult to drive an advanced student. If the more advanced options are not provided during a standard practice, the experienced student may feel that the instructor has tailored the session towards advancing beginners rather than advancing everyone. Driving the advanced students will also provide motivation for the beginning students as they see the more advanced poses in action. If it’s intimidating to instruct another instructor, especially if they have a skill set that is more practiced then the instructors, the instructor should step out of the demonstration instruction form of teaching into the assistance instruction technique. Guide the advanced student through the moves while they are under your close inspection to ensure that they follow instructions. Use touch to drive full participation. Never skip the Om. Ever. And always balance out the class. If everyone faces forward, the instructor faces the class. If everyone faces each other, the instructor completes the circle. Encourage full participation for it helps set intention for the practice. In a perfect world, all yoga classes would have perfect instructors. Unfortunately, it doesn’t happen that way and you don’t normally see students giving feedback with regards to what they like. I know that if I were instructing, I would keep this list of items top on my list to make sure that the students experience as much as they can in that hour they practice. Yet, more importantly, if I don’t provide this level of sensitivity, someone else will and the student will find that other teacher. So far, it seems that most teachers don’t have these characteristics, or, they have never been asked to express them so they are hard to find. My door is open to a teacher of this caliber, thus this blog entry to place my wishes in writing. May your practice be filled with instruction as outlined above. The other morning, I woke up impressed to investigate the cellular level digestive process in relations to light and how it affects human energy. Over the years, I’ve heard people make claims like “we are bodies of light”, or “the body runs on electricity”, but it always sounds a little odd or misplaced, for we don’t ‘plug’ ourselves in like you’d plug in a light bulb. At times, I’ve almost wanted to laugh when someone says “I’m a light worker.” Yet now, I’m wondering if there might be some substance behind the claims. The first thing that my investigation led me to was photosynthesis. Searching the web, we find a simple definition at YourDictionary.com. On the surface of things, we all know that chlorophyll aids in the transformation of radiant energy into chemical energy. Yeah, I know the definition doesn’t explicitly say “chemical energy”, but what does ‘into a chemical form’ really mean? Chlorophyll molecules are specifically arranged in and around photosystems which are embedded in the thylakoid membranes of chloroplasts. In these complexes, chlorophyll serves two primary functions. The function of the vast majority of chlorophyll (up to several hundred molecules per photosystem) is to absorb light and transfer that light energy by resonance energy transfer to a specific chlorophyll pair in the reaction center of the photosystems. Because of chlorophyll’s selectivity regarding the wavelength of light it absorbs, areas of a leaf containing the molecule will appear green. The definition goes into greater detail, but the key idea here is that the chlorophyll molecule absorbs a specific band (or bands) of sunlight and uses it to create organic compounds at the molecular level. To expand upon this a little, we go back to the definition of Photosynthesis and look at the fundamental diagram that uses light as the catalyst. Notice that Carbon Dioxide combined with water under the influence of light change form into sugar and oxygen. Yet, nowhere in this formula does it mention the transforming chlorophyll molecule. As a side, note that the chlorophyll molecule is a specific arrangement of carbon, hydrogen, oxygen, nitrogen and magnesium. To the right is a Chlorophyll a diagram form Wikipedia. At the heart of the Chlorophyll molecule is a formation that gets its own name, the porphyrin. Fortunately, the internet provides great descriptions of what this molecule is. A porphyrin (pronounced POR-fur-in) is an organic compound that contains four pyrrole rings. A pyrrole is a pentagon-shaped ring of four carbon atoms with a nitrogen atom at one corner (C4H5N). So basically, at the core of the Chlorophyll molecule is the porphyrin which, in this case, holds Magnesium (Mg) as the key mineral. 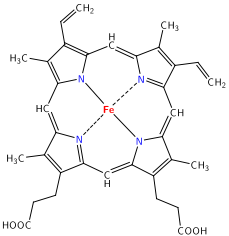 It turns out that a similar porphyrin molecule sits at the heart of the hemoglobin molecule. Also on the right just below the Chlorophyll molecule is a picture showing that the key difference is the iron at the heart of the compound. I know that these diagrams may seem a little complex, but there is a great little article located here that helps explain the connections. Ok, so back to the basic formula; Carbon Dioxide, water and light, under the influence of the Chlorophyll molecule transforms these two common elements into sugar and oxygen. Great. Looking a bit closer, the process of converting light energy into chemical energy is known at the Calvin Cycle. This all sounds simple enough, but the puzzling part is still – what does the light do? Specifically, why are the molecules aligned differently when light is introduced? When the light is introduced, do the atoms change electromagnetically so that they will naturally want to reform into a “higher energy state?” And, ultimately, is the light lost? Nutrients commonly used by animal and plant cells in respiration include glucose, amino acids and fatty acids, and a common oxidizing agent (electron acceptor) is molecular oxygen (O2). The electron accepting power of an acceptor molecule is measured by its electron affinity which is the energy released when filling the highest unoccupied molecular orbital. In chemistry, a molecular orbital (or MO) is a mathematical function that describes the wave-like behavior of an electron in a molecule. This function can be used to calculate chemical and physical properties such as the probability of finding an electron in any specific region. If existence where this simple, it would seem that the chlorophyll molecule has the ability to focus specific wavelengths of light that excites atoms so that the electrons move to higher molecular orbits that allow for the natural formation of higher ‘energy’ molecules. Electromagnetic radiation (often abbreviated E-M radiation or EMR) is a phenomenon that takes the form of self-propagating waves in a vacuum or in matter. It consists of electric and magnetic field components which oscillate in phase perpendicular to each other and perpendicular to the direction of energy propagation. 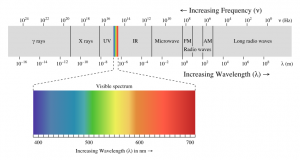 Electromagnetic radiation is classified into several types according to the frequency of its wave; these types include (in order of increasing frequency and decreasing wavelength): radio waves, microwaves, terahertz radiation, infrared radiation, visible light, ultraviolet radiation, X-rays and gamma rays. A small and somewhat variable window of frequencies is sensed by the eyes of various organisms; this is what is called the visible spectrum, or light. Scrolling down in the definition of light, we find a great chart that shows all the different wavelengths of ‘light’. Of all the different wavelengths of light, Chlorophyll operates on a small sliver of the visible spectrum. Likewise, the visible spectrum is minute relative to all the available wavelengths. Also notice that ‘light’ is a specific type of Electromagnetic radiation. It would seem that the energy of light is captured and stored, at an atomic level, and used again at a previous time – as food in the human body. Also, if atoms change state within the body, it would make sense that the energy released as electromagnetic energy would also be released within the body. If electromagnetic energy is released by the body as it ‘harvests’ the energy stored atomically, does that make light a waste product? Also, if that energy escapes the body, does it affect other living organisms? If Electromagnetic energy can change the state of atoms giving them a ‘charge’ that can be tapped into later, is Electromagnetic energy also given off as the ‘charge’ is released? If so, the claim that we are light beings may not be a farfetched statement – if you consider Electromagnetic energy, light. Because Chlorophyll and Hemoglobin share a molecular structure that is nearly identical, is there some process – related to electromagnetic energy – that the Hemoglobin molecule performs in the body? For instance, if Chlorophyll focus light so that it transforms atoms into higher energy states, might the structure of the hemoglobin molecule help focus the release of that stored electromagnetic energy? If the simple cellular functions within the body run on electromagnetic energy, might there be other sources of electromagnetic energy that the body can tap into as it does sugar? Or, are there substances that hold higher amounts of electromagnetic energy that could be used by the body? If super-conductivity exists at an atomic level that can be used by the body, could that energy source be infinite? There are so many puzzles in life, yet this one has sparked my curiosity this week. I hope that these words have sparked a bit of truth in you. Today is a great day to start a blog. I’m making a conscious effort to join the online communities where I can learn and share ideas and experiences. There is so much to learn and so many great sources. I hope to share some that I’ve found with you! And yes, I know there are millions of blogs out there and you’re probably thinking, how could this one be any better? Well, that is what I’m here to figure out and make happen. With the great resources of the internet at my finger tips, I’ve been able to get this far. And, I figure, this is just a baby step. Over time, I’m sure this site will evolve into something aesthetically pleasing and functionally useable. Who knows, maybe others will want to author articles and interact here. We shall see. Thanks for stopping by and reading my first post. Not only did I plant Peas today, but the seeds of WordPress have been unleashed at blog.GenuineObservations.com!